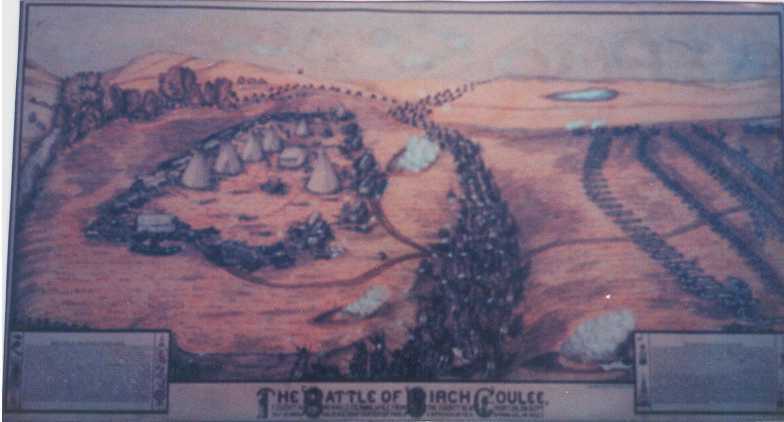 At the battle of Birch Coulee the whites consisted of 150 inexperienced men. They were under command of Captain Joseph Anderson, Major Joseph Brown, and Captain Hiram P. Grant. They were sent from Fort Ridgely to this area to locate bands of Indians, bury the dead settlers killed by the Indians, and bring back a report to General Sibley. That night the expedition, which consisted of 150 men, about 100 horses, a lot of wagons, and artillery, arrived at Birch Coulee where it was decided to camp that night. The site was great for camping and just as good of a place for battle, from the standpoint of the Indians. It was fairly level ground, with woods on the south and west sides, and the coulee on the east side, and hills on the north side. 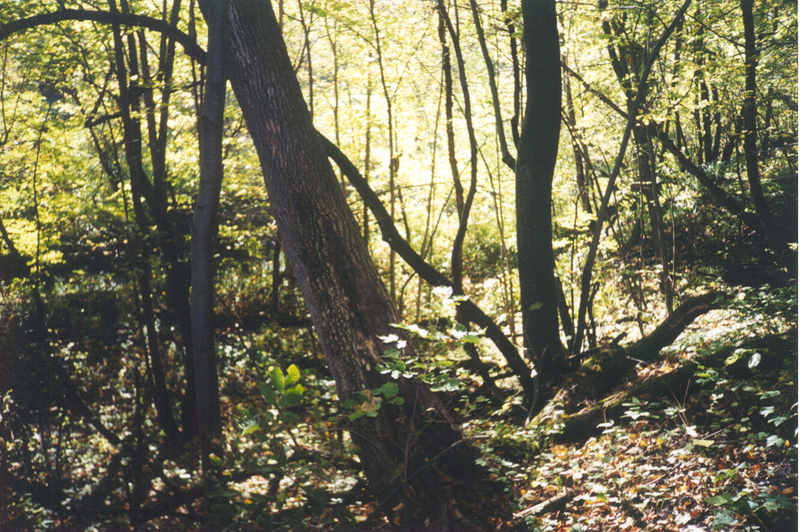 The camp was made in the shape of a large circle, which was about 200 yards from the woods. The wagons and horses were placed on the outside of the circle. The men set up their tents in the middle of the circle. Captain Grant ordered 30 men to guard the camp. They were to be picket posts. There were 3 men per post, and they were to change 3 times during the night. The previous day captain Grant found a woman nearly dead from wounds by the Indians. She escaped and wondered into the woods where she had existed on berries for 14 days. She was taken along with the troops and survived the battle at Birch Coulee, although many bullets passed through the wagon in which she had been placed for safety. (left)-This is a picture of where the groups of Indians were positioned. The far left stone points in the direction of where Big Eagle was. The next stone points in the direction of the trees and the coulee (pictured at right) where Red Legs was positioned. The middle right stone is pointing towards where the encampment of the white soldiers were. 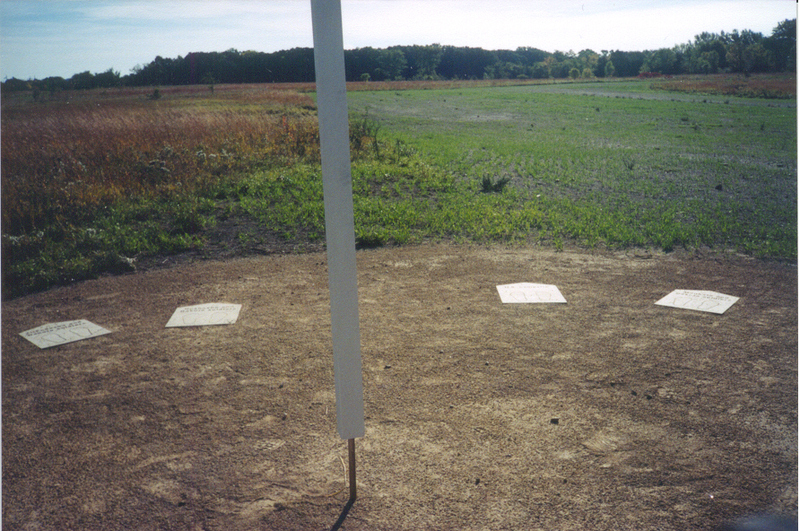 The far right stone points where Mankato was located. The pole you see in the picture is the location of Gray Bird and his warriors. Never dreaming of Indians, the soldiers slept peacefully. The Dakota prepared a strategy to surround the detachment that night and make an assault at daybreak. They posted themselves around the camp, taking advantage of the natural protection. Just as the sun appeared one of the military posts thought he saw something approaching him. He fired at the object and immediately a hail of bullets came from 300 guns. Almost instantly every horse was killed and many of the soldiers were also killed. The attack continued for more than 3 hours in which 20 soldiers were killed and 60 wounded. The survivors then dug holes to protect themselves. The fighting was heard 16 miles away at Fort Ridgely. Sibley then sent out 240 men to relieve the soldiers at Birch Coulee. When they arrived at Birch Coulee, they found only a few survivors and 90 dead horses. Big Eagle later reported that he had seen only two dead Indians. (left)-Pictured here is Captain Joseph Anderson(left) and Wamditanka (Big Eagle), a Mdewakanton chief(right). 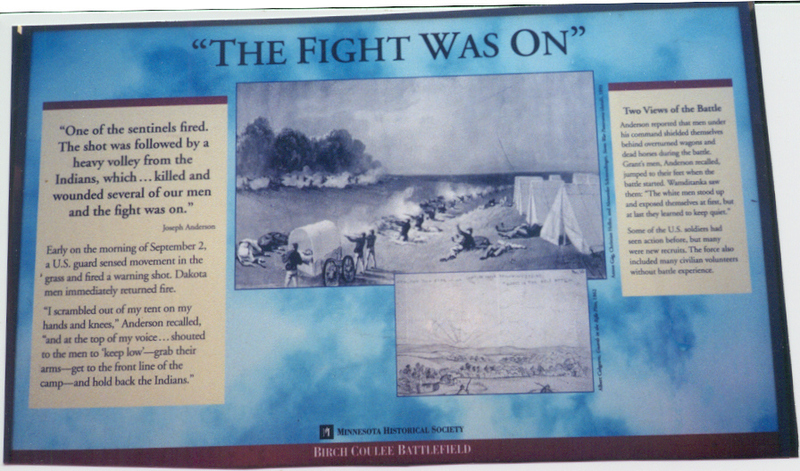 (right)-A picture of what the battle might have looked like from the position of the encampment. RRC 10th grade Am. Hist. Class, 1999. Potter, Merle. 101 Best Stories of Minnesota: The Battle of Birch Coulee. Minneapolis: Schmitt Publications, 1956. 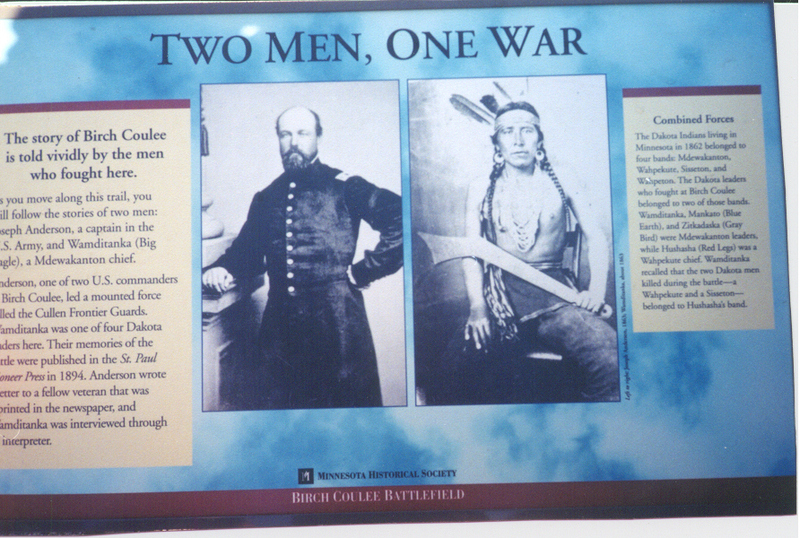 Pictures taken from Birch Coulee State Historical Site.